Caupo was the only Livonian elder to be called “as if a king and elder” (quasi rex et senior Lyvonum de Thoreida) and was the only new Livonian convert to Christianity to visit the pope in Rome and to be seen in the eyes of his contemporaries as a dependable Christian. On September 21, 1217, pierced by spears, he lost his life in the crusaders’ campaign near Viljandi. Caupo’s body was burned and his ashes buried at Kubesele. 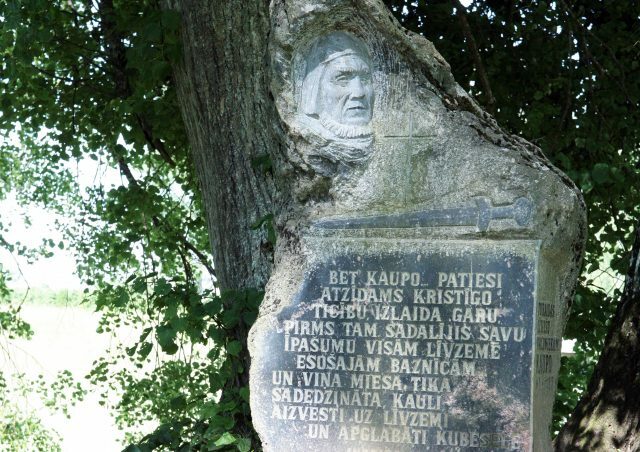 On September 22, 2001, a monument to the Turaida Livonian leader Caupo, designed by sculptor Gaida Grundberga, was unveiled by the Krimulda Church. Monument to Caupo. Picture: A. Linarts. A monument to the Livonian leader Ako was unveiled in 1994. It is located along the Daugava at the end of the dam of the Rīga Hydroelectric Power Plant, close to the Rīga-Daugavpils highway. 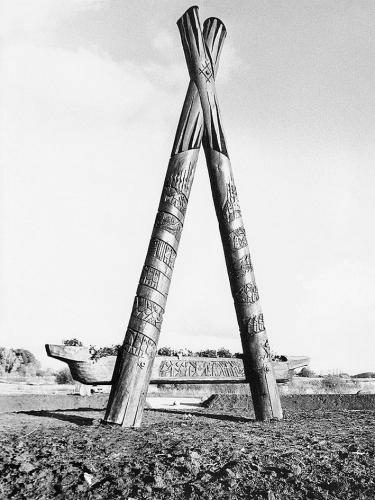 The memorial designed by sculptor Ģirts Burvis is a tribute to the desire for freedom of the ancient inhabitants of the Salaspils region. In the centre a large letter A rises up. Scenes from Rīga, battles, the hill fort, and the ancient harbour are depicted along its pillars. Its symbolic rampart has four gates and along the top of it are the ancient sentries turned to stone. The Ako memorial was updated with new designs from ancient history in 2013. Additional facilities were built for the monument along the Daugava in 2014. Monument to the Livonians and their leader Ako in Salaspils. An exhibit from the Museum of the History of Rīga and Navigation, which can be seen in the cloister of the Rīga Dom Church, displays a possible Livonian idol, a so-called Salaspils stone head, which is one of the most unique archaeological discoveries made in Latvia. The stone head was found at the end of 1851 or 1852 in a field by a postal road between Salaspils and Ikšķile. 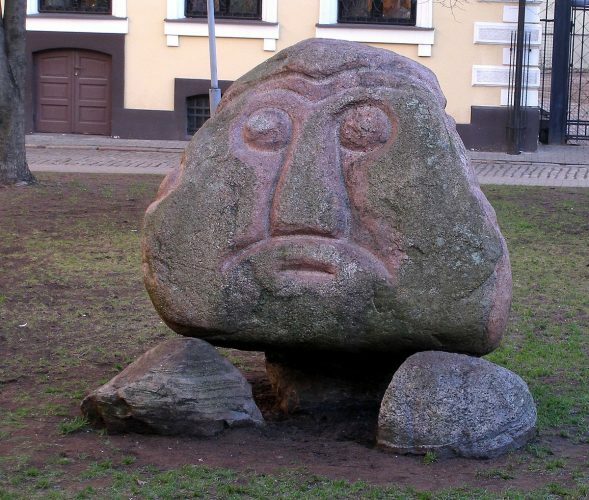 At the end of the 19th century, the stone head went missing until it was found again in 2000 during archaeological excavations of the courtyard of the Rīga Dom Church. Since 2003, a copy of the head, sculpted by Ģirts Burvis, has been on display in Livonian Square in the Old Town District of Rīga. On the three boulders forming the 1.45 m high sculpture, the original contours are replicated and are formed by a shallow groove along the reddish brown granite surface. 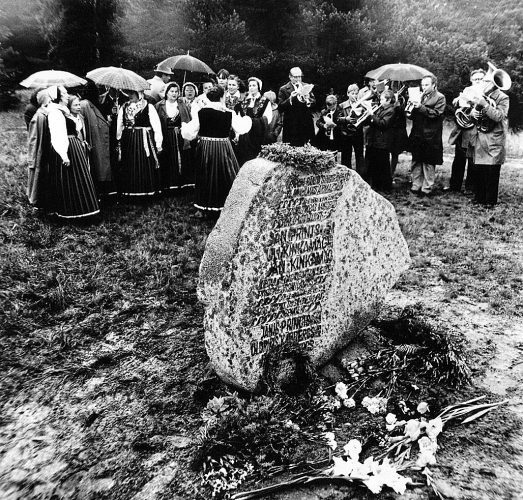 During Poetry Days on September 12, 1978, a monument was placed in the Miķeļtornis cemetery honouring Livonian poets. It was designed by sculptor Kārlis Dane. Opening of the monument in Miķeļtornis. 1978. In Ventspils on August 6, 2006, in the square at the intersection of Prinču Street and Kroņa Street, a monument was unveiled honouring Livonian poet, sacristan, and community worker Jāņ Prints, Sr. (1796-1868). The granite sculpture designed by Indulis Ojārs Ranka is a tribute to the individual who began the tradition of Livonian and Latvian book publishing and was the first Livonian who worked to develop his native language. The poetry collection “The Sacred Songs and Prayers of Sailors” (the book was created along with Prints’ son Jāņ Prints, Jr.) is the second collection of original poetry ever published in Latvian following the publication of the Songs of Neredzīgais Indriķis (Blind Indriķis) in 1806. Jāņ Prints is buried in the Cirpstene cemetery. 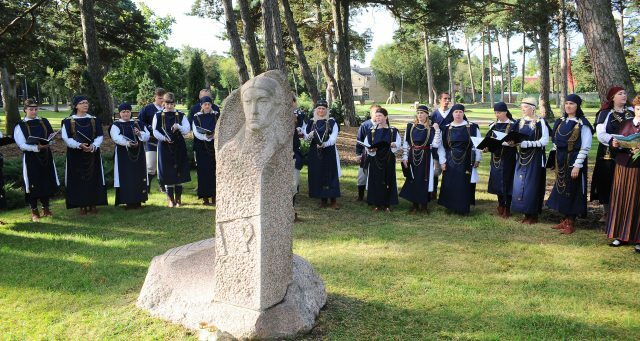 Salaspils choir “Lōja” at the monument of Jāņ Prints, Sr. Picture: Juris Presņikovs. 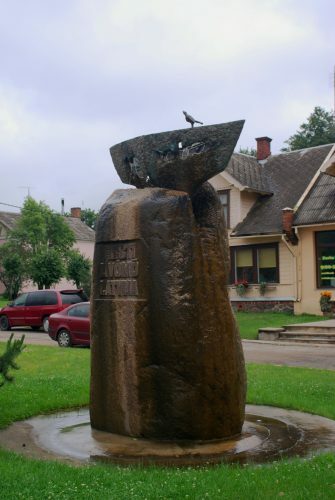 A boundary marker between the Latvian, Livonians, and Estonians, designed by Zigrīda and Juris Rapa and shaped as a stone boat with a bird, was unveiled in the Staicele town centre in July 2004. The idea of the Salaca as a boundary river is immortalized in the boat cast in bronze, which is placed on a three-meter high boulder weighing 14 tons. The bird on the edge of the boat symbolizes life – though all things change in life, birds always return to their nests. Livonian monument in Staicele. Picture: mapio.net.